Tired of your toddler’s meltdowns causing you to rush your shopping and fear that everyone is judging you? Try these proven ways to help avoid these situations. 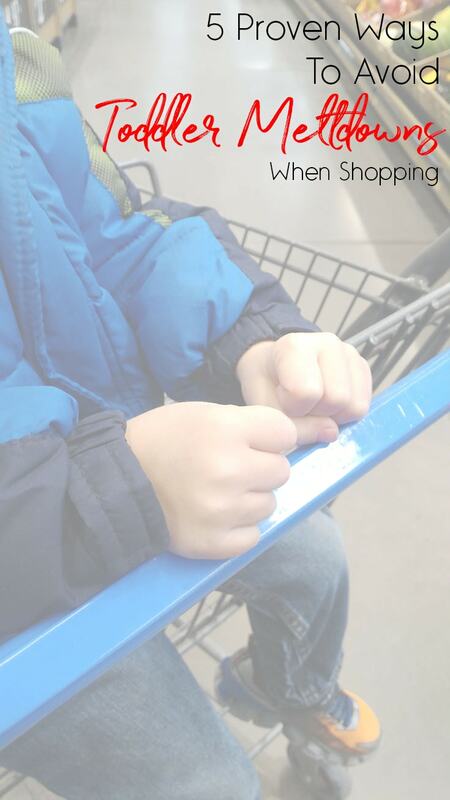 We’ve all been there–the dreaded toddler meltdown while shopping. He rides in the cart like a little ticking time-bomb, then all of a sudden his arm won’t go into the sleeve of his coat, his brother looked at him funny, or maybe you even had to say no to buying the toy that he asked if he could have twenty-one times in a row. Whatever the reason for the meltdown, you’re now a full-blown ball of nerves because your child is throwing a world-class fit. Even worse, now it appears that all eyes are on you judging your parenting tactics. It’s time to lower your head to the child’s ear and try to console/keep him busy while rushing around the store to finish gathering the last of everything on your list. Once you arrive at the checkout lanes, of course, everyone else decided to shop at the same time as you and they are all full. Then you head to self-checkout and manage to scan every item in your cart, one-handed, with your other hand trying to prevent the child from unbuckling himself and jumping out of the cart. By the time you get home and unload the car, you then discover the giant list of things you forgot to grab while you were racing around the store. To help save you from developing more grey hairs than I have while at the store, I’ve listed five methods that have been tested and proven to work with my kids while shopping. I find preparedness is key. . .and trial-and-error. A whole lot of trial-and-error. Tip # 1 – It’s all about the snacks. We all know grocery shopping takes a while. The little ones tend to get hungry looking at all the food as we wheel them down aisle after aisle. Having a little snack in your purse or diaper bag can keep them busy and satisfied while you shop. Be sure to store it in a container or bag from home so that the store can clearly tell it was something you brought with you and didn’t take while there. Tip #2 – I spy, with my little eye, something blue. Make shopping fun for the kids! Play a simple game with them as you stand in front of the soup aisle looking for that special kind you purchased three trips ago that your husband liked so much. When the kids have a goal, it can make shopping enjoyable for them, too. Tip #3 – At the point of meltdown, redirect! Some meltdowns simply aren’t preventable, but being able to manage them is key. If the tantrum is over something you are not purchasing, try to redirect their attention to something else before it escalates. I like to keep a keychain on my bag that is a cartoon character my child likes. If I feel a tantrum coming on, I unhook the keychain (normally a plastic hook), and ask my toddler to help me put it back on. Many times they will start playing with the character and forget all about what it was they wanted in the first place. Tip #4 – Keep yourself calm. Children can pick up on your emotions. They feed off them. If you remain calm, your child will soon calm down. Even try some humor to help lighten the mood. Tip #5 – The Internet (Walmart Online Grocery Pickup). Did you just see the clouds part and the ray of sunshine pouring through? Yup, online shopping is now a real thing and it is AH-mazing. With Walmart’s new Online Grocery Pickup, you don’t have to walk through the store at all. Picture quietly sitting at your computer after your child is asleep for the night, reviewing the list of grocery items you need, and carefully placing each one into your virtual cart. Please tell me you just sighed at the thought of this stress-free experience. With this technology, you can now easily double-check all your items before placing your order, and take as much time as you need without a tiny child trying to compete for your attention. Once you have everything in your cart, the check-out process is simple. Pay for your groceries right then and schedule the pick-up time and date that best fits your schedule. The pick-up process is a breeze as well. 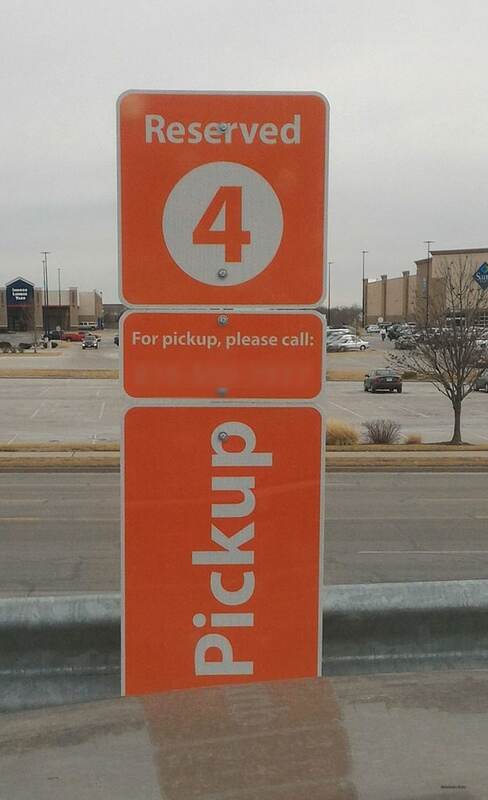 Head to the Walmart store you selected, and follow the orange signs to a special area just for Online Grocery Pickup customers. Use the special Walmart Grocery App (not the regular Walmart App) or simply call the phone number on the signs in front of your car. 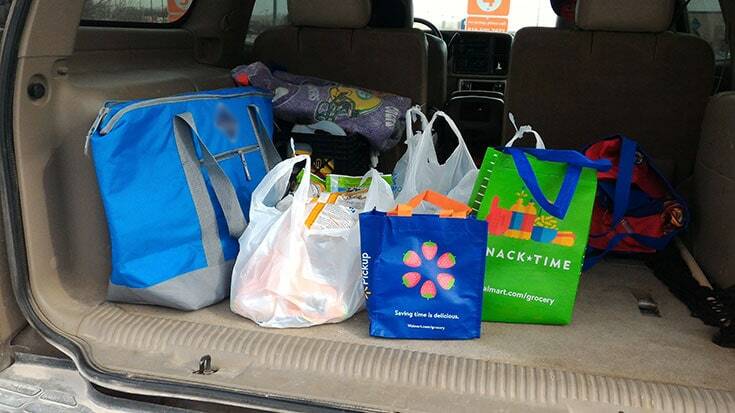 Tell them which parking spot you are in and wait for a Walmart personal shopper to bring your groceries out to your car and load them up. The entire process is EXTREMELY easy – and meltdown-free! Note: If you use the Walmart Savings Catcher, you can easily have your receipt added to your account. If you are a first time user of Walmart’s Grocery Pickup, use promo code WOWFRESH to save $10 on your first order!!! Do you have an idea to help curb the shopping meltdowns? If so, please leave us a comment with your tips below. 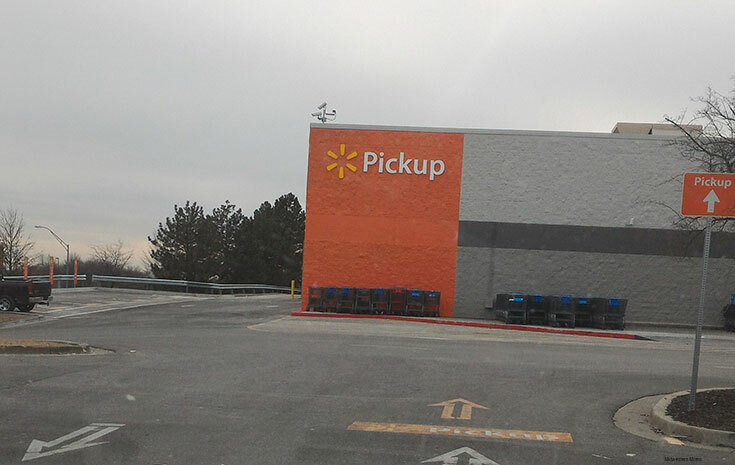 Have you used the new Walmart Grocery Pickup? It’s been quite the game changer for our family. Be sure to let us know about your experience. Very good article and ideas. Thank you.